Borovets is the oldest Bulgarian winter resort with a history that dates back to 1896. 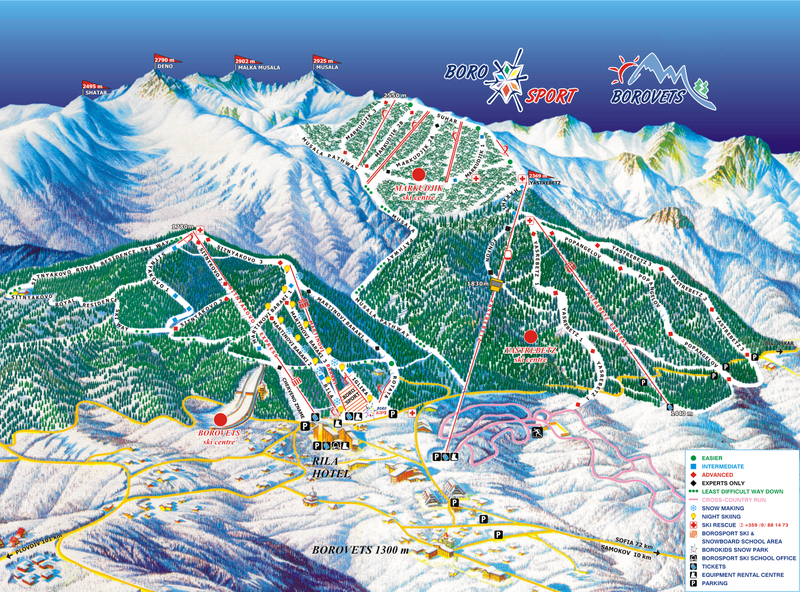 Today Borovets is the biggest skiing center in the country in terms of length and capacity of ski runs and lifts. It is situated on the northern slopes of the Musala ridge in the eastern part of Rila mountain. Huddled in venerable pine woods over 1300m above sea level it is the perfect place for winter sports and recreation. The winter in the resort is mild and snowy. The average temperature in January - the coldest month is about 4.8°C. The ski season usually spans from mid-December till April. The resort offers excellent conditions for winter sports: alpine skiing, snowboarding and cross country. The alpine runs of Borovets offer excellent conditions for snowboarding. In addition, in the high parts of Rila Mountain, in the Markudjik Ski Center, during high season the snow reaches over 2 meters of depth, providing unlimited opportunities for the freestylers. We would like to inform you that excellent skills are a must for the daring.